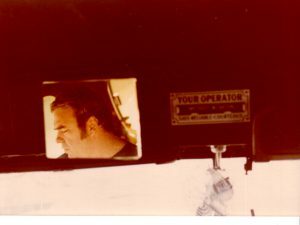 In 1975, Phyllis was watching TV and called my attention to Hoyt Axton singing in a jail cell on a TV Western. She said, “Hey, you should play with him!” I thought that might be a cool thing to do, given the opportunity. A year later, Hoyt was looking for a steel player and Lance Dickerson and Buffalo Bruce Barlow recommended me for the position. He called me up and hired me sight-unseen and sound-unheard. Trusting fellow, he. A few days later, I got four or five albums in the mail. Hey, one of my biggest steel guitar heroes, Ralph Mooney, was on one of the tracks! So I studied all the songs and when two weeks passed, I was pretty confident I could do the task well. I was living in San Jose at the time, so I got a ride for me and my double-12 Emmons, 10-string Dobro, Webb amp, and suitcase to a truck stop in West Sacramento. Destination: Grand Ole Opry. We got to the Opry with no time to rehearse, so backstage we just ran through a couple of songs. Hoyt told me that, when it came to my solos, they were all mine and my only job would be to please the audience. “I don’t care if you play what’s on the record. I don’t care if you play one note or a thousand notes. If you please the audience, I’m happy.” Music to my ears. I was a little nervous as we started to play. We only had a few minutes during the live commercial to run out—and, in my case, plug in to an unknown amp with whatever settings there were—and be fully ready to play. Standing just over my shoulder and behind me were two of my favorite steel players, Hal Rugg and Weldon Myrick. I thought to myself, “Well, the kid from California comes out and shows them all how to play Country Music. Great. How’s that gonna go?” But it was fun and invigorating, and Hal and Weldon both complimented my playing. Works for me. 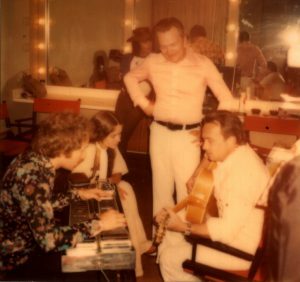 Later, we met Teddy and Doyle Wilburn and we sat around swapping songs in one of the dressing rooms. Yeah, that’s Nicolette Larson in the picture with me. After we hung out some more backstage, we loaded up our stuff and went to Ernest Tubb’s Record Shop, where it’s the tradition for some folks to play right after the Opry. It’s a long narrow room packed to the rafters with country music fans. Because that wasn’t enough, we went to radio station WSM at midnight along with the Wilburn Brothers and played live. We decided to not bring the pedal steel up to the station, so I had just gotten my first 10-string dobro, which I’d tuned to E9 (E B E F# G# B E G# D# F#). It was, and still is somewhat, a challenge to play that tuning without pedals and I was on the spot playing live over the radio for who knows how many thousands of discerning listeners. The next night, Nicolette Larson introduced me to Guy Clark, and we sat around and played until the wee hours along with Steve Fromholz. I got to hear some of the songs that Guy would be recording over the next few days. I’ll save that for a Guy Clark segment. Stay tuned. 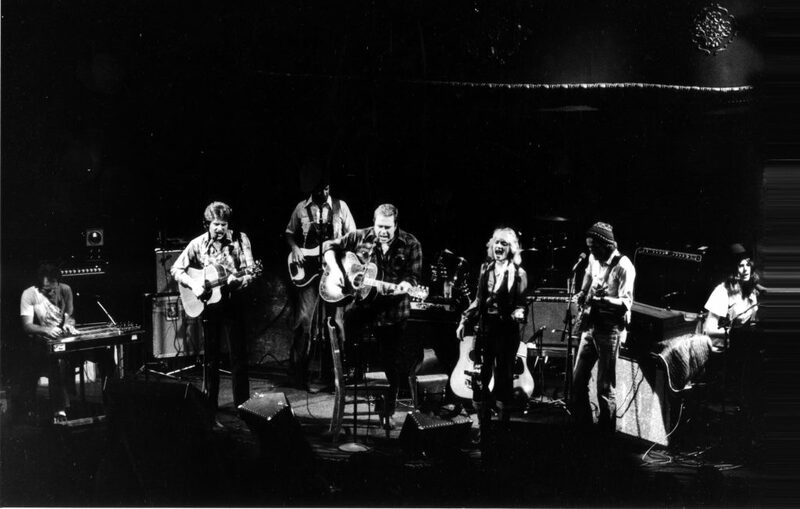 Above is Hoyt and band at the Great American Music Hall in San Francisco in 1977. Below was the Austin City Limits show we did in 1979, but apparently it got taken down.